The Rubber Back Carpet Mat was developed as a more economical option to fit the needs of our ever-changing market conditions. Per our customer's requests, we spent over one year in research and development in order to bring these very unique and cost-effective carpet mats to market. The backing is made of a SBR/NR non-staining, non-marking anti-skid rubber compound, so your mat stays put! 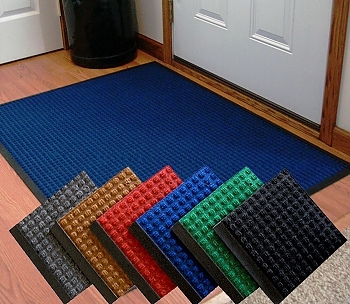 A molded rubber border keeps dirt and moisture in the mat, protecting your carpets and floors. The carpet is made of quick-drying polyester, which is extremely strong with durable fibers resistant to most chemicals. The polyester also resists stretching and shrinking, mildew and abrasion. 2' x 3' [L x W] 5 lbs. 3' x 4' [L x W] 9 lbs. 3' x 5' [L x W] 11 lbs. 4' x 6' [L x W] 18 lbs.